The rip in the time-space continuum that is a Belgian Bank Holiday weekend is fast approaching. 1 May falls on a Saturday, which means that for two days - two days that will feel like ALL ETERNITY - Belgium will just shut. Yes. I realise that it is probably very admirable not to exploit your workforce and to take two days out from mindless consumption and so on. It's not the shops not being shut I mind so much (spot the giant, ridiculous lie in that statement) it's the ghostly, empty streets, creating the feeling that you are all alone in this town with a pair of snarling zombie children whose daily alloted half hour of Nintendo is up. I am being unfair, I do all the snarling. Lashes, if left to his own devices for long enough, will devise some ghastly project involving several of the giant pee scented boxes in the cellar, a range of vital kitchen utensils that I will be unable to find for months thereafter, and enough sellotape to immobilise a whole troupe of Girl Scounts (a prospect I consider most Sundays when they come on their regular extortion visits). Fingers less so. He is unenchanted by tv, rejects the cinema out of hand, and is constantly frustrated by his brother's stream of smart-arse chat and subtle teasing. There are exceptional, golden moments when they are both amused, but generally those involve some act of wholesale naughtiness that will end in parental fury (see: painting new carpet with the brightly coloured maize chips of SATAN dipped in shampoo, pouring away €€€€€ of expensive unguent to make potions) or someone getting hurt (see tonight: stabbing a giant cardboard box repeatedly with a sharpened Mikado stick "to make a starry sky" is likely to end in maiming). What to do? What to do, indeed. I do not have a car, a fact the children keen about in Greek chorus at every opportunity. "When are you getting a car?" "Why can't we have a car?" "Papa has a car" "C'est trop loiiiiiiin" "my feet hurt". Since they would like a car to go as far as the corner shop, they have limited credibility, but when it comes to a Belgian long weekend, they really do have a point. Previous May bank holiday weekends were expediently dealt with by a parent-imposed trip to my favourite wildlife park to bait the free roaming capybaras and see if we could make off with a penguin. But my favourite wildlife park is about as accessible by public transport as Jupiter. The same goes for a range of other activities. I'm generally in favour of getting out, despite the complaints, but a Sunday tram is as frequently sighted as a five legged unicorn. The weather, which has been unseasonally beautiful (I am writing this sitting outside in a garden full of bird song, lilac and barbecue fumes, with an ill-advised ant wandering across the top of my keyboard), is going to take a sharp turn for the grey and cold. Of course it is! I suppose I could go wild and fall back on my incompetent friends at Taxis Bleus, but where would we go, anyway? Whatever I suggest gets one of two responses. E: Shall we go to the X (where x is a putatively child-friendly activity of some sort)? E: I SAID shall we go to the X? E: FOR GOD'S SAKE. I SAID SHALL WE GO TO THE X, GODAMMIT. E wanders away muttering. Several hours later when it is too late to do anything, both children appear, their little faces filled with expectant hope. Child 1: Can we go to X now? E: But you said you didn't want to go! Child 2: Nooooo, we said we DID want to go! We want to go. NOW. E: But it's too late now! It shuts in half an hour! Child 1: BUT YOU SAID WE COULD GOOOOOOOO! Weeping and gnashing of teeth ensues from all parties. E: Shall we go the Y (where Y is another putatively child friendly type activity)? Child 1: OUAIS! Chouette! Yes, can we go now? Child 2: Uuuuuuuugh naoooon j'ai pas envie no I won't go you can't make me NO. E: (stabbing self repeatedly in eye with a giant Mikado) Are you sure you don't want to go darling? E: But you know there are rivers of chocolate and free Bakugans and I will buy you a pony? Child 1: Can I have a pony too? E: We'll see, it doesn't look like YOUR BROTHER (accusing stare) will let us go. Civil society breaks down altogether in a cycle of bribery, recriminations and logistical chaos. E locks herself in the bathroom with a bottle of gin, boys revert happily to teasing the dog and stealing biscuits. Helpful readers will suggest I find friends in a similar quandary and arrange some kind of joint sufferance thing. I don't have any friends like that, really. The Belgian ones will all be off having some interminable family meal. The others were all ceded as part of our infinitely civilised separation. I need to find more, enticing them into my slovenly dwelling with the promise of, erm, an improved immune system. the only bar in the vicinity that will be open. I am developing a sick fascination with it, but you need a moustache to drink there. I suppose that could be arranged. Moustache workshop! Weekend quandary solved! I am all too familiar with both scenarios. Here is my solution. If they refuse, I threaten to take them bird-watching. Works a treat. Almost any activity is better than bird-watching. That cafe looks pretty ace to me. And who knows, they might even play a little Pascal Obispo, judging by its inviting exterieur. Perhaps a lot of wet weather walking with the wonderful weepette? Wearing moustaches. You could pretend to be looking at cars. S'pose the boys are too young to drink? Moustaches??? You know who has a supply of them, don't you? Antonia! I'm sure she'd share*. Holy mother, you are giving *me* an anxiety attack just thinking about your weekend. Is it too late to buy something from Ikea and make them help you assemble it over the holiday? I don't know, maybe little bedside tables? (Surely you need bedside tables and if they're wonky, who cares?) Boys still like doing crap like that, don't they? I have five younger brothers and from age 8 onward they seemed to like (in no particular order): video games, building/taking apart crap, eating, and poking each other with sharp things. The car hire thing sounds good! Do the close museums and stuff as well? People would be up in arms if that happened! May holiday is for making children do educational stuff they don't want to or going to theme parks, everyone knows that! Shall I have a work with the Belgiumers for you? Claire/Lisa-Marie - Sadly I cannot hire a car due to not having a licence (I am qualified to drive but do not have the actual document since wallet theft in November, ahem, organisational brilliance at work once more). Em - Ha. They like the idea of walking the weepette about as much as Jonathan's children like bird watching. Margaret - Are you hiding in my house somewhere? There is a non-assembled IKEA bedside table here. I can't do it, it's too hard. Maybe I should delegate, good idea. Smack crumple bang and I found a very good shop with every kind of fake moustache you could hope for recently. I may have to stock up. BB - Oh yes, cash and food. It's like a bloody siege. 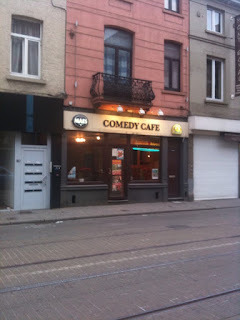 See you in the 'Comedy Cafe', I'll be wearing a droopy Zapata. Dose them heavily with Calpol and hope they sleep through? Or dose yourself and sleep through, leaving them to forage for the weekend. It'll be character-building! It could be worse, the Comedy Cafe used to do transvestite nights on a Thursday. Hard to believe I know but it did happen and unfortunately I never had the balls to go. I suggest that they camp outside in the back garden. If you haven't got a tent, make them build one out of cardboard boxes/sticks/blankets etc. Make them eat outside too. Even if it's cold and wet. Of course it's all in how you present the idea, i.e. 'there's absolutely no way I'd ever let you boys sleep in the garden tonight'. I would draw the line at an unsupervised campfire though, I'm not completely irresponsible. You're a very good writer, particularly when writing about your children. Reminds me of how children were back in the day ('70s in my case and probably a lot of other people's), but as described from a unique perspective - unsentimentally seeing them as they are, almost like a fellow child, but in a way which can only be achieved through acceptance and love. That sounds so familiar. To cheer you, I got home yesterday to a fractured water pipe which is the main water pipe which means anything involving turning on a tap, using water in this house creates leakage. And was woken at three this morning by Oscar and Tallulah vomiting. I have been awash in floods and vomit ever since. My bank holiday weekend is shaping up nicely. Anon - You've actually BEEN there? I just peer through the window, awed at the scenes of gloomy, wordless beer consumption. Wow. Respect. You're going about this all the wrong way... you aren't given them the right choices. Instead of "do you want to go to X", you phrase it "Would you rather go to X today, or shall we clean the bathroom floor with our toothbrushes?" Or "Which one is it today - Y, or these extra homework papers I've managed to get the teacher to dredge up for you?" Don't make "neither" an option - kind of like when my daughter would say "I'm bored" - and I'd tell her to grab the dustmop. She quickly learned how to amuse herself. Now Now Waffle - it could be worse. Try a long Belgain weekend - preceeded by a dutch national holiday which your school decides it is going to celebrate. The add to that, a school sports (half) day on Overijse, and then sprinkle with an injured soldier which means you can't go anywhere and do anything this weekend - at all. I suffer from holiday angst too. I cannot believe how many bloody 'inservice' days teachers get. Get some little friends round and shunt them all out into the garden. Build a suitable landscape for Bakugan using all the stuff set aside for recycling. Start buying in craft kits from on-line shops to keep for rainy-day projects (mug painting, things with sequins etc). I can't believe it will be shut on a Bank Holiday! Reading may not be the finest place in the world but at least it organises beer and music festivals on the BH's and the shops stay open till late. LOL at "I said I DID want to go." My kids also have a Masters in revisionist history. c) um, put the telly on. again. Thats what we do. Actually, today we played "hide the tiny Pirate Stencil Book in a very large garden" which worked for about an hour.There were some complicated rules involving a song about rabbits which confused the 3 year old and kept things fresh. wow. all these comments make me thankful for a nice quiet childless house yet again. ladies (and gentlemen), i salute you and your hard work! now off to pour myself a glass of wine.